The expansion and development plans formulated by King Fahd for the Prophet’s Mosque in the Holy City of Madinah were as ambitious as those for the Holy Mosque in Makkah. 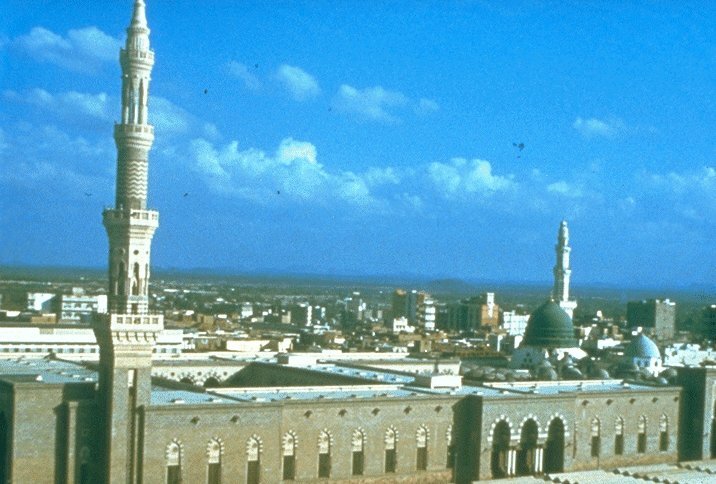 Work on the Prophet’s Mosque in Madinah was launched by King Fahd in 1985 (1405/06 AH) and the Mosque can now accommodate in excess of one million worshippers at the busiest times. A unique feature of the expansion project was the development of the 27 main plazas. Each plaza is now capped by a state-of-the-art sliding dome, which can be rapidly opened or closed according to the weather and can be used in unison or separately as required. Elaborately carved stone friezes decorate the domes, and the plazas have been paved in decorative geometrically patterned marble tiles. The project also necessitated the building of six additional minarets, each 105-meter construction crowned with a 4 ton gold-plated crescent. The development of the surrounding open areas and the seven newly constructed entrances ensure the smooth passage of pilgrims into the Prophet’s Mosque. Indeed, the designers of the entire project have masterfully considered every eventuality of the existing and future capacity of the Mosque, and all this within the constraints of the existing architectural pattern. The building extensions have therefore been fitted out with a suitable number of staircases and escalators. The designers have added an extension to the roof area for praying purposes, whilst also allowing for the possibility of adding another floor to accommodate worshippers in the future. Like the splendidly redeveloped Holy Mosque in the Holy City of Makkah, the Prophet’s Mosque is now fully air-conditioned. The comfort of worshippers has been further enhanced, however, by the unique and ingeniously conceived shading system. Twelve enormous mechanically operated Teflon umbrellas, six in each court of the Mosque, have been developed by King Fahd’s architects to protect pilgrims and help them withstand the high temperatures. The Prophet’s Mosque project also includes provision of extensive car parking facilities and the construction of a new dual carriageway, the Bab Alsalam Road, linking Madinat Alhujaj on the western side of the Holy City of Madinah to the site of the Mosque. A labyrinth of service tunnels, drainage systems and supply networks also now criss-crosses the area. In fact, the magnitude of support services made it necessary to construct a vast basement complex in which to accommodate the service equipment and wiring needs, as well as various other maintenance works. The reconstructed main gate leading into the Mosque site, the new King Fahd entrance, is situated on the northern side, and is topped with a profusion of domes and minarets on both sides. The exquisite decorations and architectural touches here and elsewhere are in complete harmony with earlier building work on the site, and they feature wonderfully crafted golden grilles, cornices, pillars, brass doors and marble works, as well as special ornately carved pigeon holes for the Holy Qur’an.